Pleiotropy: Is Eigenfactor really a good measure? 1. How do I interpret a journal's Eigenfactor™score? A journal's Eigenfactor score is our measure of the journal's total importance to the scientific community. 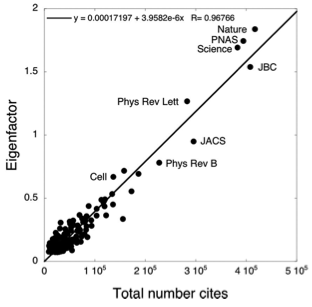 With all else equal, a journal's Eigenfactor score doubles when it doubles in size. Thus a very large journal such as the Journal of Biological Chemistry which publishes more than 6,000 articles annually, will have extremely high Eigenfactor scores simply based upon its size. Whaaat?! That seems misleading, doesn't it? Just because a journal publishes more articles certainly doesn't mean it is more prestigious to publish in. I realize that that wasn't the question; the question was which journals are most influential, and this I can see. However, what does that matter for the author who has to choose the journal to submit to? Take PLoS journals. If you submit to PLoS Biology or PLoS Computational Biology, then upon rejection they'll suggest you to submit to PLoS ONE. Why? Well, clearly because it is way easier to get accepted there - PLoS ONE is a much larger journal (with a policy of accepting papers as long as they are not erroneous). PLoS ONE is thus twice as influential as PLoS Biology, and over five times as influential as PLoS Comp Bio. However, no sane author I know would prefer to publish in PLoS ONE over PLoS Biology, so what's the use, then? None, as far as I am concerned. Thanks for the writeup, Bjorn. The Eigenfactor score was developed as a tool for evaluating the total importance of a journal, analogous to total count of citations to that journal over a given period. Such a metric can be useful for a number of purposes, such as making collections decisions about which journals to purchase with a limited library budget. As you note, this metric scales with the size of a journal. However, the Eigenfactor score is not the proper metric for the purpose you discuss here: deciding which journal is the most prestigious. Individual authors or researchers interested in deciding where to send their work will be interested in the influence-per-paper that a given journal has. Another of the Eigenfactor metrics, the Article Influence score, serves this purpose and is analogous to the Thomson-Reuters' Impact Factor score. Thus if you use the proper Eigenfactor metric for comparing prestige (or equivalently, per-paper influence) you'll see that PLoS Biology is four times as prestigious as PLoS One.